Wells Dunbar&apos;s tumblr post of demographic data from the City&apos;s African-American Quality of Life Initiative reminded me that there&apos;s a local democracy deficit concerning municipal policies that might help boost median income. I visualize the family median income data below. As you can see, overall family median income growth is sluggish, and perhaps most troubling is the fact that Hispanic/Latino family median income actually declined since 2000. So, why aren&apos;t our local discourse and policies more aggressive on this front? One part of the problem is the fragmentation of municipal-level public institutions that might be able to do something about it (AISD, ACC, City, County). A second issue is that the current election design (at-large districts for City, lack of publicly-funded elections for all entities) makes it hard for more progressive political economy coalitions to form. Third, there doesn&apos;t seem to be a lot of civic density/community organizing around boosting median incomes. Therefore, it&apos;s not surprising that Austin doesn&apos;t seem to create a lot of value with its human capital. As a result of the current recession, I think there is greater recognition that we need to refocus on the growth of middle class median income. Many of the effective policies for boosting median wages such as quality K-12, affordable higher ed, effective workforce development, and community support for private sector union organizing campaigns are all local efforts. Add these to transit, corporate subsidization, and land use…and all of a sudden local policymakers possess a pretty extensive toolkit to contribute to median income growth in their region. The question is whether proponents of such activism can get organized to empower local policymakers that want to deploy such tools. Cross-posted at Keep Austin Wonky. Next Article What&apos;s the matter with Texas? the city is not terribly concerned with maintaining a thriving middle class. We see this in the relative stagnation of wages for the bottom 85% or so of all earners over the last 20 years. Austin&apos;s city government is largely run by and for elites. We see this manifested in the way the city markets itself: their target audience is made up mostly of the well-educated and unencumbered. 15 years ago, a family of 4 clocking less than $50k/year could get along just fine and even afford a decent home within 5 miles of downtown. Now, most of those families have fled Austin – or at least the inner bubble – for the more affordable confines of exurbia (Kyle, Manor, Pflugerville, etc.). Austin&apos;s approach has been to leverage it&apos;s niche industries to attract upper-income and upwardly mobile to re-settle and re-develop it&apos;s inner core, and the result has been a sharp narrowing of options for working families. And of course here, as in the rest of the state, Hispanics make up an out-sized percentage of those families. We also see it in the way the city is run: well-funded, pet-issue interest groups can get an airing on just about anything that puts a burr in their saddle. The Council, ZAP, Solid Waste and other commissions give inordinate amounts of attention to provincial matters that aren&apos;t even on the radar of most working folks. It seems that the narrower the constituency, the greater the point pressure it&apos;s issues are accorded. What facilitates this, of course, is that Austin&apos;s governing institutions are almost entirely peopled by well-connected central/west Austin denizens who aren&apos;t exactly tuned in with the day-to-day struggles of the financially insolvent. These folks are continually re-elected and re-appointed under within a structure that a city like Austin ought to be ashamed of. Essentially Austin is run by about 12% of the city&apos;s registered voters, highly concentrated within its expensive geographic core. The at-large council and the “gentleman&apos;s agreement” that tokenizes representation of minorities – and all but eliminates it for the economic working class – should have been done away with long ago in favor of single member districts and a real reform of the appointment process. But the city has arrived at a point where, even if some “progressive” interest group were to focus on SMDs as a pet issue and bring it to a referendum, it&apos;s all but impossible to imagine a city election where that same 12% would vote to hand over their own de facto control. A true glasnost for Austin government will have to be brought about with a genuine grassroots campaign that is born and nurtured in the outer neighborhoods. And what are the odds of that? Can we start to turn it around? I think an important first step is to be very concrete about the policies we need to boost median incomes over the next ten years. Are there policies you think might work? 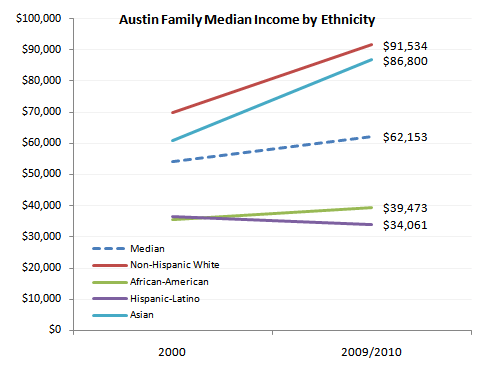 Further, I don&apos;t think Austin&apos;s policymakers are a plutocratic cabal; some groups are better organized than others for sure, but I think that many policymakers, as well as many of the “12%” would agree it is in our community&apos;s best interests to boost overall median incomes and prevent another lost decade for Latino families. But those of us that favor these outcomes need to organize around a concrete alternative, brand it, push it. I think the city council elections might be a good chance to start the education and organizing process and to ask policymakers to get creative.